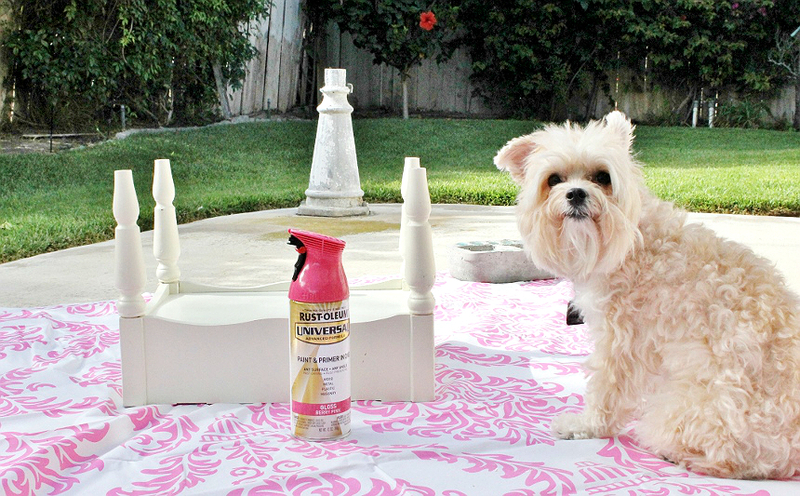 This post is sponsored by Petmate® and the BlogPaws® Pet Influencer Network™. I am being compensated to help share information about Petmate’s JW Hol-ee Gourmet™ line of interactive dog toys, but Momma Told Me only shares information we feel is relevant to our readers. Petmate™ is not responsible for the content of this article. I learned a long time ago that life deserves all the flavor you can get your paws on. If something ignites one or more of your senses, hoard it. Bottle it up and sprinkle it on everything. After all, that's how you know you're alive. I've raised our fur children with just as much enthusiasm. Don't get me wrong- nutrition and diet are some of the most important things I'm tasked with as their caregiver, but part of being owned by a human is having the chance to experience a smorgasbord of sites, tastes, and experiences an ordinary yard dog might not. That's part of the reason I decided that Nora's favorite color was Teal- because life's too short to be dull and such a sassy dog needed a sassy color to strut around downtown in. 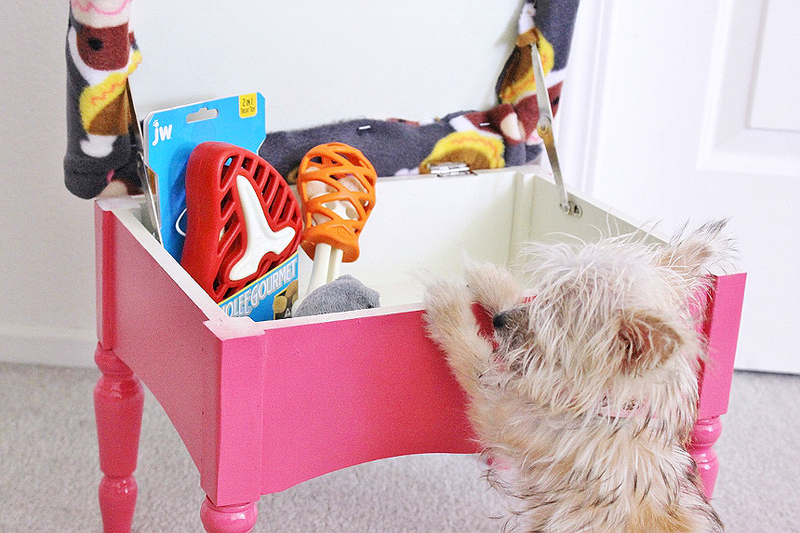 Since Nora was our first canine-child she also got spoiled with a plethora of adorable toys. Most of which never made it out of the toy bin, and were simply there for photo opportunities or decoration. 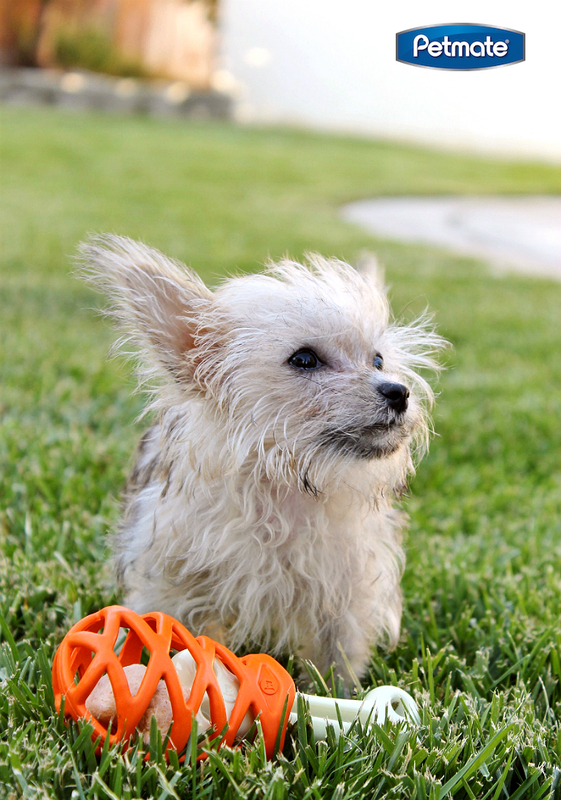 However a, much wiser and seasoned, pet parent had suggested a specific brand to us, JW® Pets by Petmate. 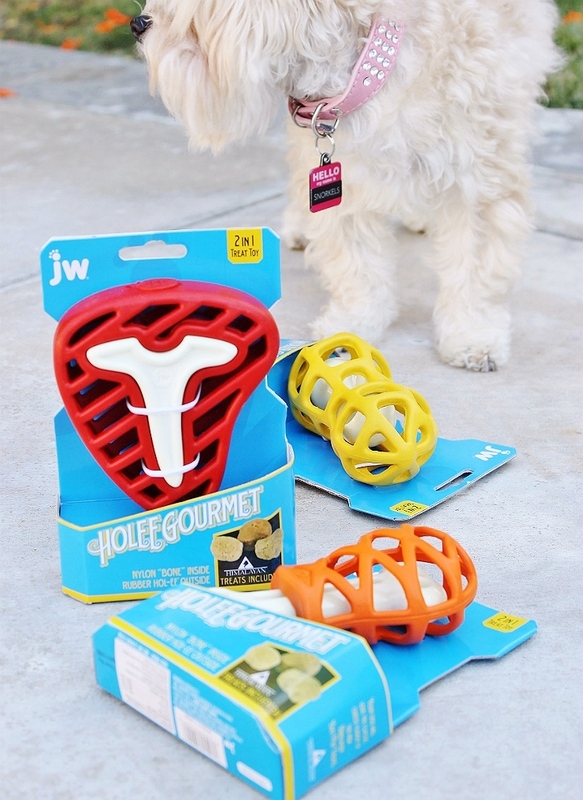 She'd seen one of Nora's infamous harness patterns (the one with the sugar skulls) and instantly knew we'd love JW® Pets for their range of tongue in cheek, yet practical and innovative, pet toys. We'd started simple at first, with some tough Megalast Bear chew toys and an appropriate iSqueak Bouncin' Bowling Pin that helped ease Nora's teething pains and destructive puppy habits. I have many blurry cellphone pics of her gnawing away or cuddling with those JW® toys! 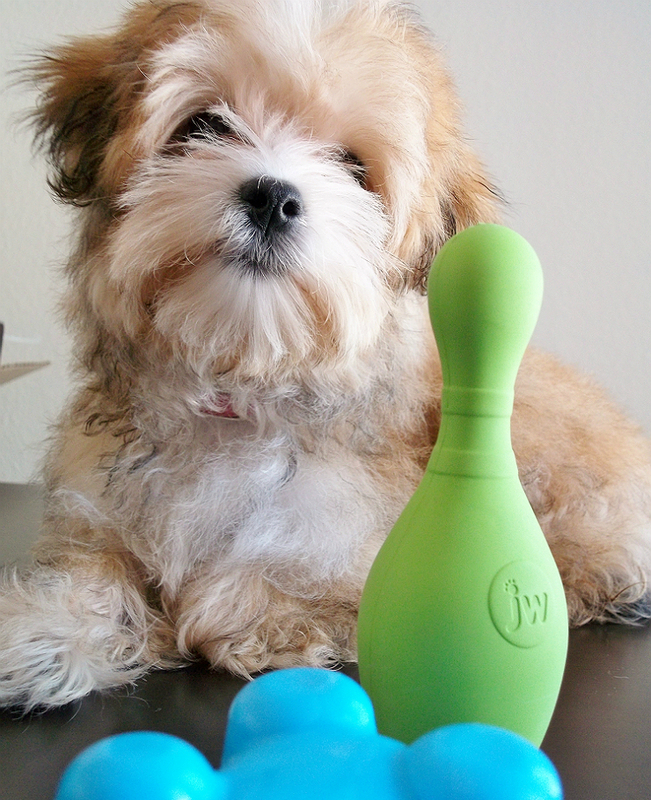 As I said, we fell in love with the JW Pets brand first-most for their tongue-in-cheek modern toy designs. Adorable, brightly colored, characters and shapes I actually wanted strewn across the floor in our home. Even better they were TOUGH- they withstood years, yes, years of chewing without becoming mangled, filthy, or unrecognizable. So much so that, when we added a new canine to our family the first toy we pulled out of Nora's old toy bin was that trusty JW bowling pin. Oh- yes, our NEW family member. Well, I suppose now is as good a time as any to introduce Miss Gidget, the- well, we're not sure what she is, aside from super tiny. She's almost 6 months old, fits in my shoe, and has yet to break the 2lb mark on the scale. She has a heck of a foster story to tell, but that's for another post. In any case, with Gidget being at that age where she has the urge to, literally, rip baby teeth out- and Nora being at the age where she just wants all the delicious things she can get her snout on, we were delighted to discover the newest JW® Pets by Petmate® innovation, Hol-ee Gourmet™ collection. If you've ever been at the pet store and seen the rubber ball-like toys with holes in them (maybe even 'feet') then you've probably seen a JW® Hol-ee toy before. We had half a dozen at one point in Nora's puppy-hood, they were the best for stuffing treats in and occupying her for hours. 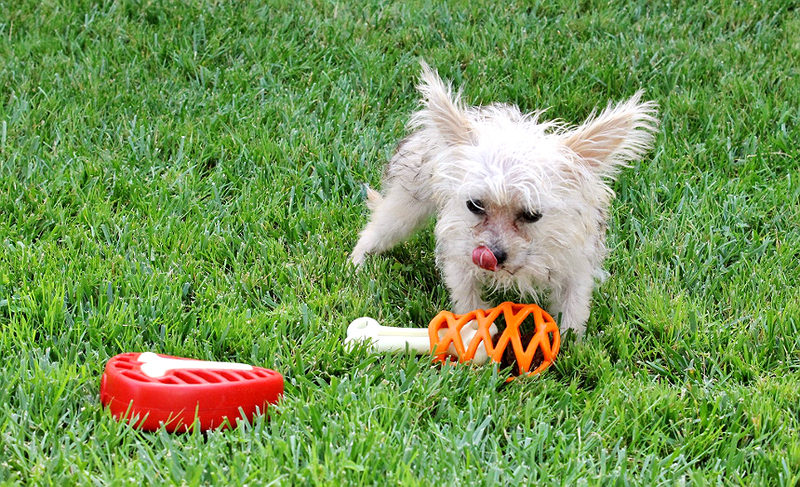 Petmate®'s JW® Hol-ee Gourmet™ toys take that concept to a whole, or should I say hole, new level. 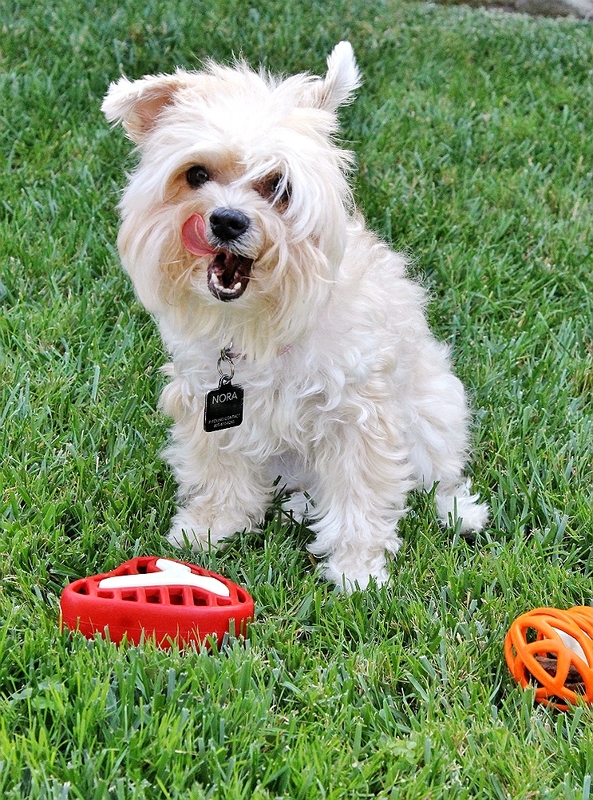 Sold in 2 different sizes and available through Petmate.com, or in store at PetSmart, these adorable food themed toys encourage your furry companions to play with their food. I'd even say they help your dog work their brain through intelligent treating that makes treats last longer; keeping pesky pups occupied and out of trouble. You'll find Hol-ee Gourmet in a turkey leg, peanut, and steak design; each with their own unique shapes and engaging treat presentations. 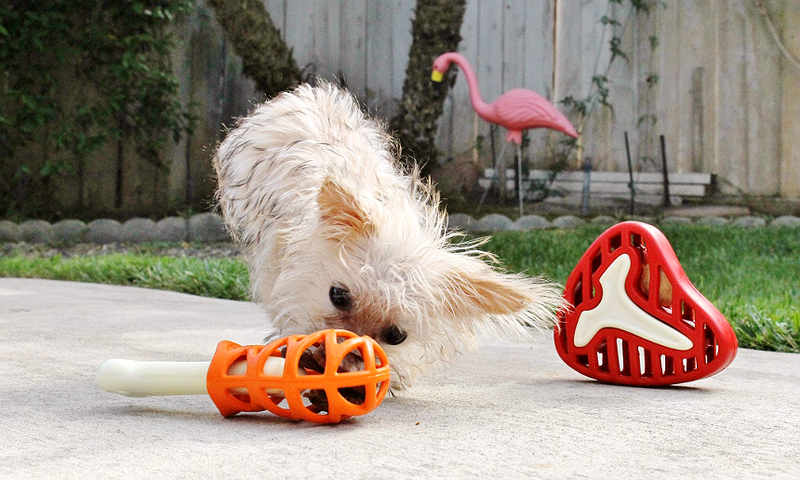 The durable, chew ready, outer 'cage' of the toys are great for teething and cleaning teeth while also holding larger treats (such as jerky and nuggets) inside. Both of our dogs go nuts trying to figure out how to get their treats out, and spend hours gnawing and pawing away at them. 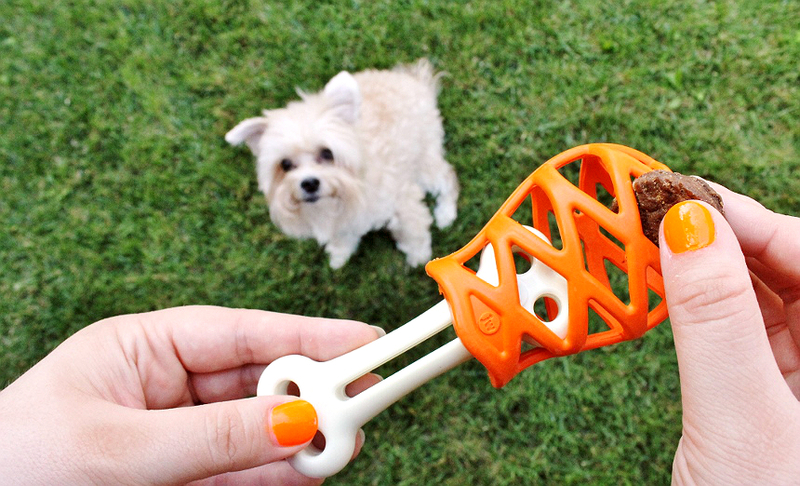 The inner 'bone' part of the toy is built for softer treating, such as peanut butter, or other spreads. Tuck something tasty in the narrow holes and grooves of the bones and watch your pup's tongue go to town, flavor town. Alllllll right. If I'm acting extra cheesy (side note: tell JW Pets to make a Cheese shaped Hol-ee) it's because these toys are simply fun for the entire family. I get a kick out of watching the two misfits fight over them and work on getting the other's treats out first. 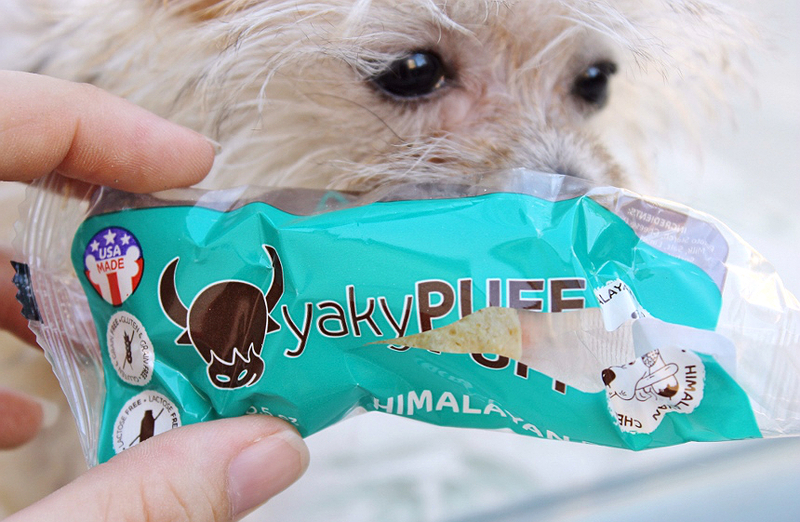 Our Petmate JW Hol-ee Gourmets also came with a Himalayan Pets Yaky Puff treat sample which already is long lasting outside oft he toy, and has lasted us up to a week per puff inside! You could say Gidget was skeptical at first- it's typical puppy logic that nothing exciting is ever presented to you. Protocol dictates you must destroy and explore everything that which is kept just out of reach (shoes, important documents, half full cups sitting on the coffee table next to the couch....) But the smell of those Yaky Puffs really won her over, and she actually has been the only of the 2 girls to figure out how to use her paws to help retrieve the treats nestled inside. 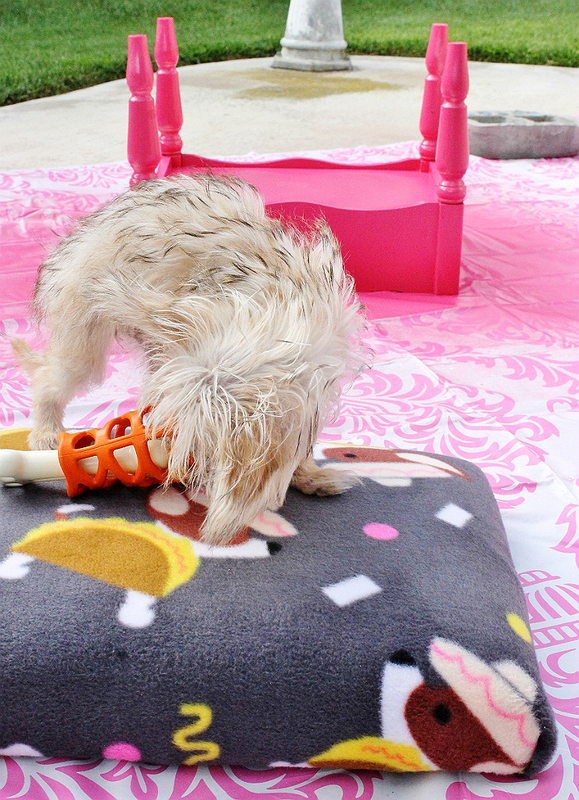 I really can't say enough about the adorable trendy designs of these JW Pets Hol-ee Gourmet treat toys- the turkey leg is absolutely genius for small and tiny dogs like Gidget. The drumstick leg 'bone' pulls out for the dog to gnaw on. I keep trying to get a shot of Gidget dragging this giant toy drumstick around by it's bone, but she's already quite camera aware! I have, however, been able to get plenty of exhausted shots, like the one above, of her passed out cuddling with it after hours of slurping and chewing. In the spirit of tongue in cheek containers I decided to give Gidget's toys their own dedicated home. I'd been holding onto an old footstool I'd found for a couple bucks at the local Goodwill. I knew I wanted to re-purpose it but I wasn't sure how until inspiration hit in the form of Hol-ee Gourmet and an adorable fleece print at the craft store. I still remember the days where I would have tried to turn this footstool into a bed for Nora, back when she was 'tiny'. Okay, she'll still pretty small but she looks like a bull moose next to Gidget! The stool, itself, was in pretty good condition minus the ugly original fabric and some yellowing to the white paint job, rendering it 'cream' in color. What I loved most, though, was the unsuspecting 'secret' compartment that was revealed when one tilted the stool top back. 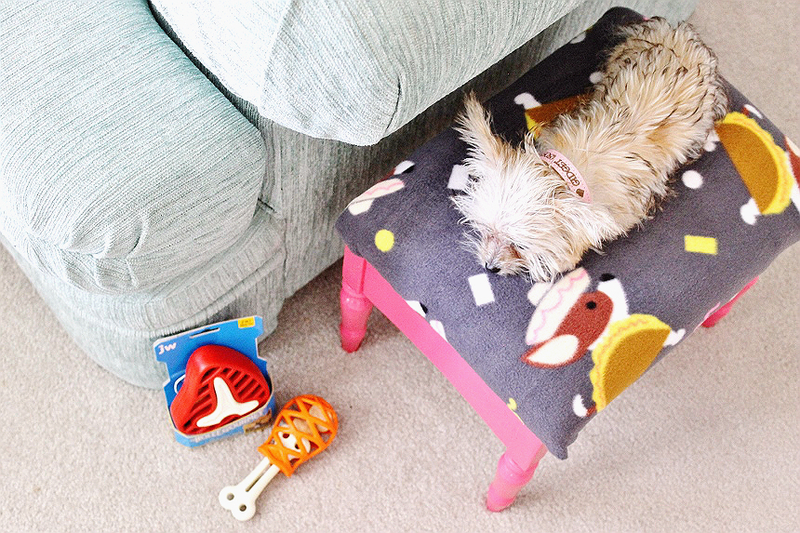 The perfect hiding place for all of the toys and treats a 2lb dog could ever want or dream of. I don't claim to be an expert in upholstery. In fact, I know nothing about upholstery. If the stool had been in worse condition I would have taken the time to sand down the old paint job, and tear off the old fabric, possibly replacing the batting inside. 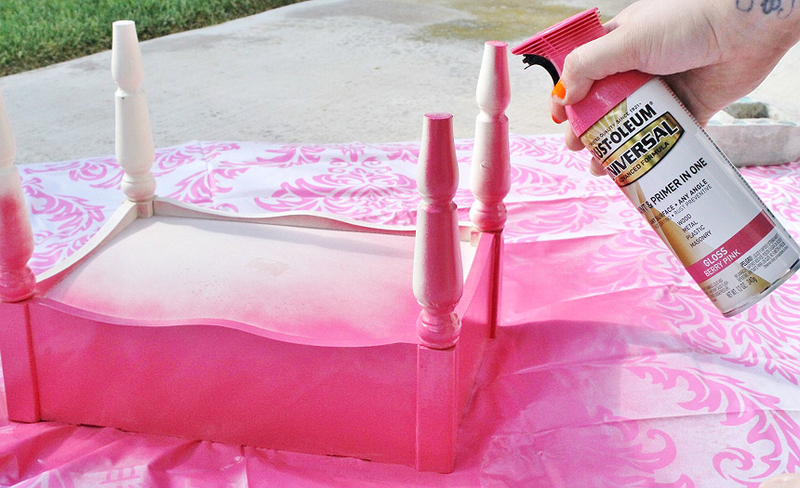 Since everything seemed well and in tact, and free of mold/stains, I opted to carefully unscrew the hardware and give the wood base a fresh coat of hot pink spray paint. 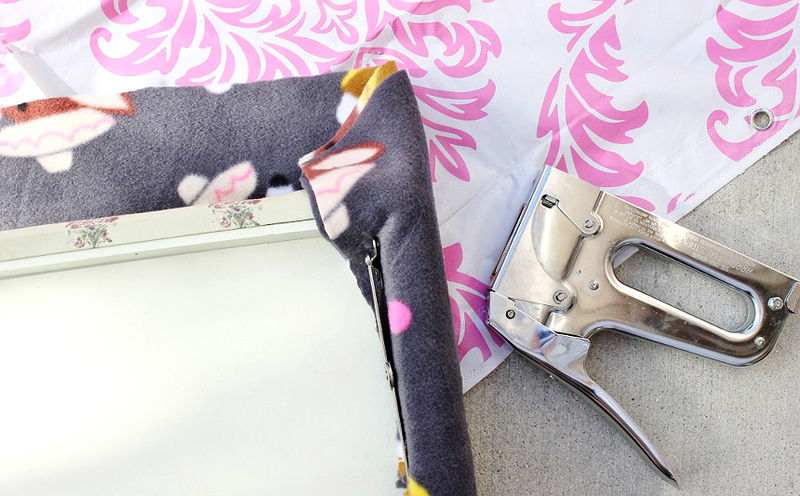 While my second coat was drying I cut my fleece fabric to size and (using a heavy duty staple gun) attached it to the inside seam of the footstool top. It wasn't the cleanest of jobs but, let's be honest, it's the inside of the container and will hardly ever be seen. 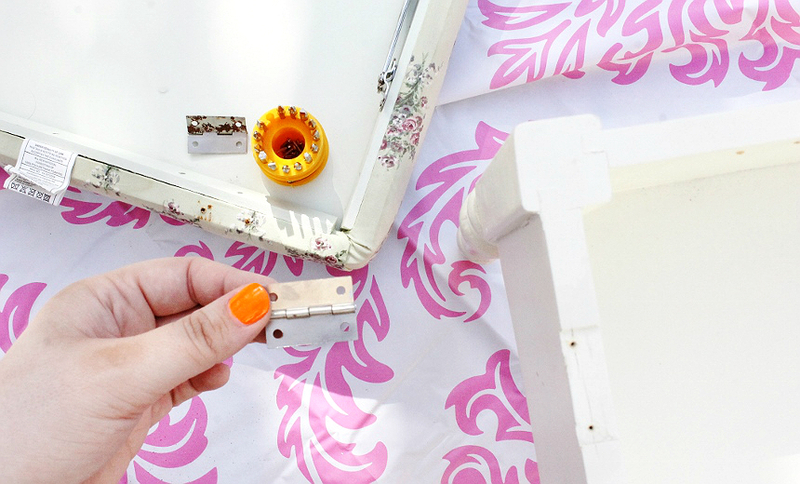 If you do attempt to do this quick and dirty, like me, be sure to mark where you screws/hardware goes in with markers or holes so you can easily re-attach them later. I was so excited about Nora's helping efforts and the fun fleece I forgot to and had to do some fancy measuring later. I had a hard time waiting for the base to dry before assembly. I'm the sort of person who likes my gratification NOW- haha, maybe I should take a lesson from the dogs. Nora and Gidget certainly found something delicious to do in the mean time. Sometimes I think people envision our home as one giant barfing neon rainbow. 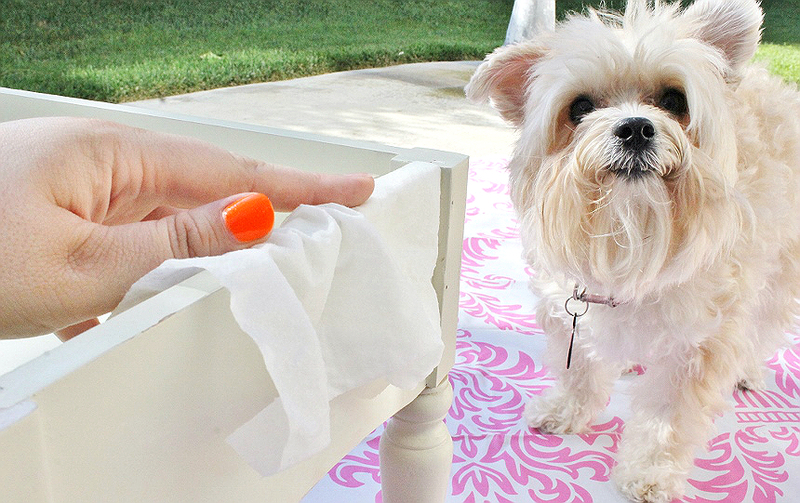 Sure- I love bright, bold, colors but I can't help what 'the girls' love. Kidding. The key to living life fun, and tongue-in-cheek is by choosing smart accent pieces that make a statement while still being practical. 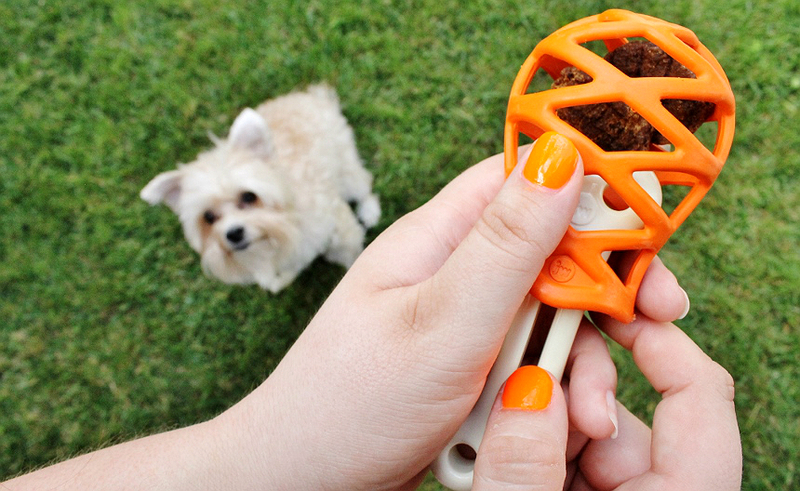 Kinda like JW Pets' Hol-ee Gourmet toys, stylish dog treat toys that occupy my four-pawed friends while adding a little splash of design too our home. 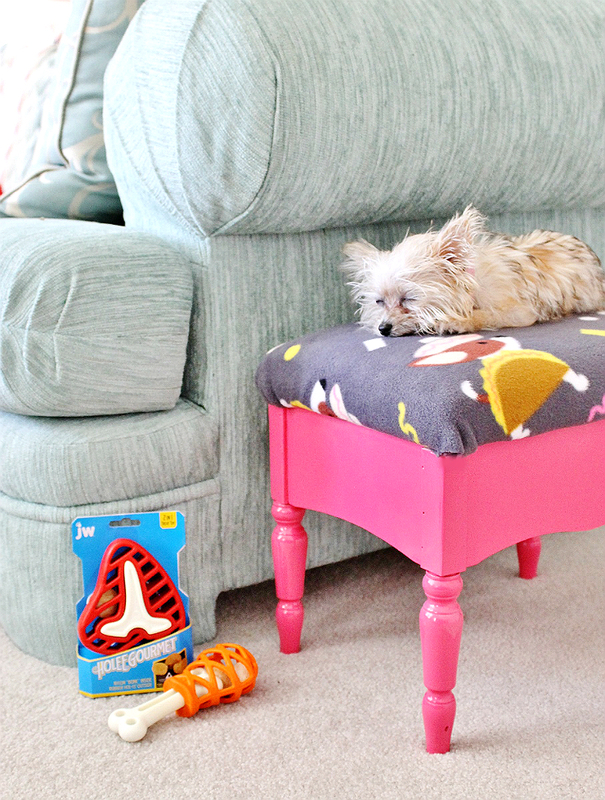 We probably won't keep the footstool front and center always- we'll rotate it in and out of rooms, but it'll always be practical for hiding those less than attractive chewed up toys and treats- haha! I'll admit, whenever I design, or buy, something for Gidget I'm always worried it'll be way too large to be practical for her to use. In the end, her sister Nora will usually inherit anything in error- but Hol-ee Gourmet was something I'd immediately been nervous about. 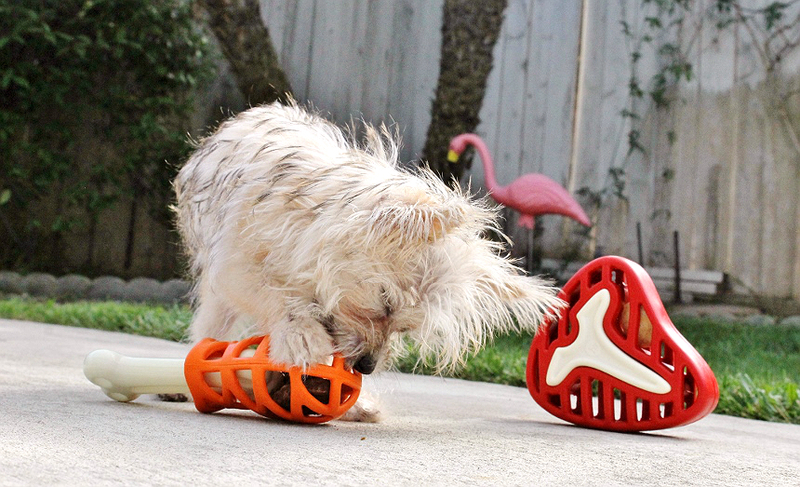 These were heavy duty toys- but the unique 'netting' design of the outer toy is really easy for even small jaws to latch onto, and Gidget truly loves throwing her body into snack time! So, while there certainly have been times where I've come into a room to find it scattered with food and looking like a mess hall, the moral of the story is to find practical ways to infuse flavor into both your life, and your pet's life. 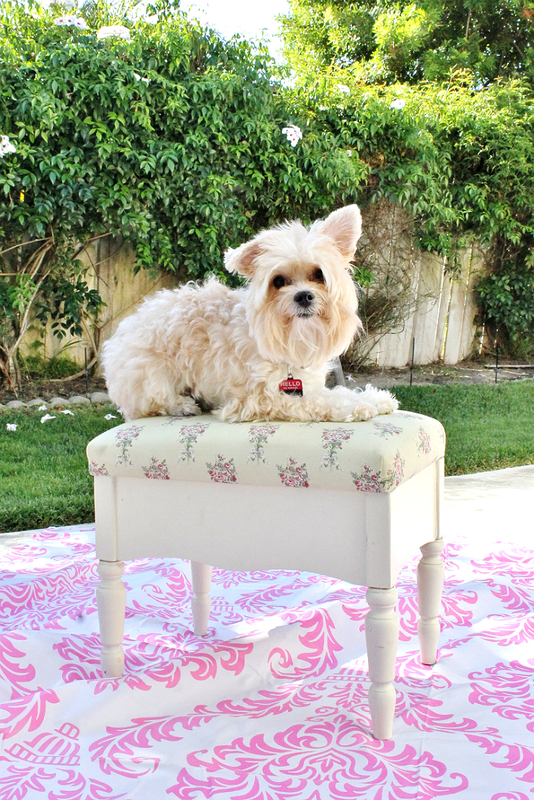 Just because I'm a crazy Cat-Dog Lady doesn't mean my home has to lack flavor and style. And, just because your dog doesn't have opposable thumbs doesn't mean they can't enjoy having their senses ignited by touch, problem solving, and taste while being treated to a delicious snack. 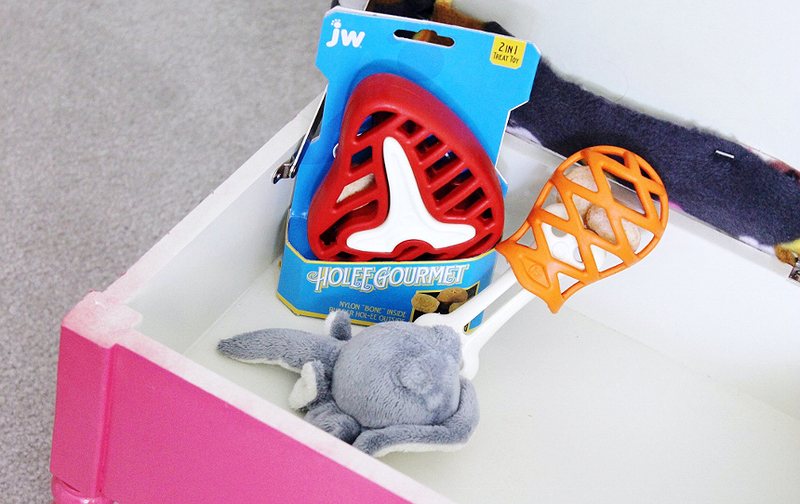 If you find these new JW Pets Hol-ee Gourmet™ treat toys as fun as us be sure to visit Petmate.com and use exclusive discount code BLOGPAWS for 15% off your Hol-ee Gourmet toy of choice. Stay up to date with the brand, and their latest pet innovations on Facebook and enter an exclusive Hol-ee Gourmet giveaway! I cannot even stand how cute your pooch is! OMG. Totes adorbs. I have to get some of those treat toys for my two guys. They would LOVE them. Those treat toys look SO FUN!! I will have to grab some for my German Shepherd...she would just love them!! Also, your furbaby is sooooo cuuuute!! My pup would LOVE this! It would keep her mind engaged for hours! She needs a something like this so that she works in her food and not my house! She would have so much fun with this! This is absolutely genius! 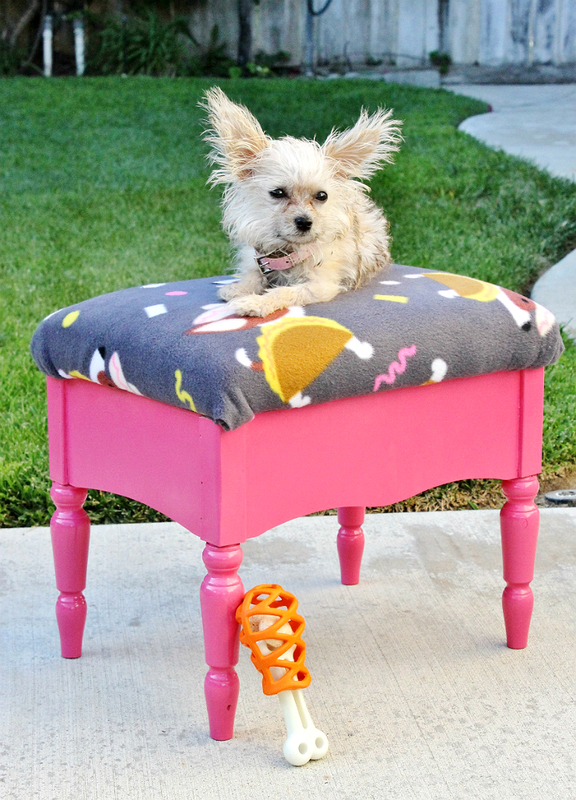 I know a pup that would love this - I especially love the fact that the toys are so vibrant in color. Your pup is so cute and photogenic! I know my daughter's dogs would love these toys! 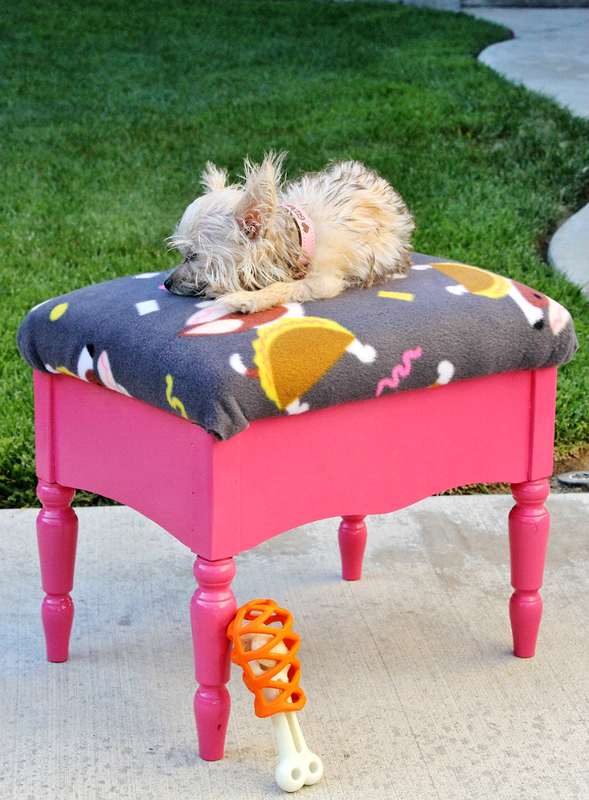 This is such a cute dog bed. I have two fur babies I love to spoil. I will have to look for JW Pets brand toys for my dogs. They would be a great way to keep them busy when they are home alone. 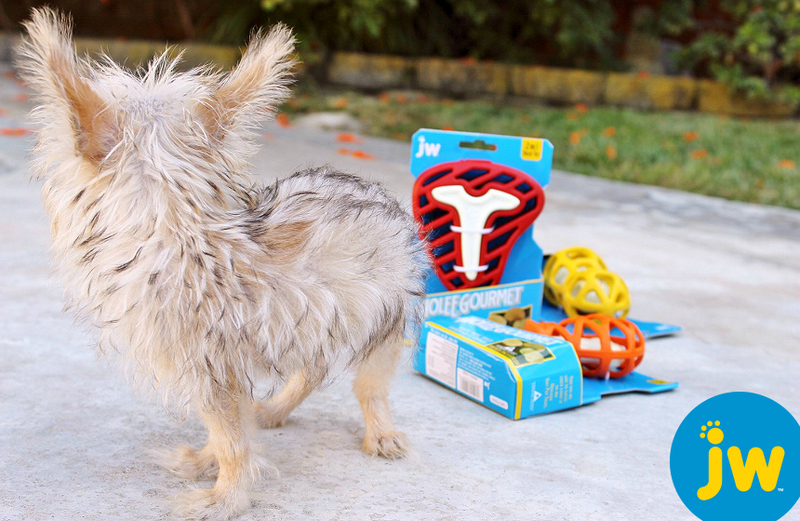 Those dog treat toys are so cute. 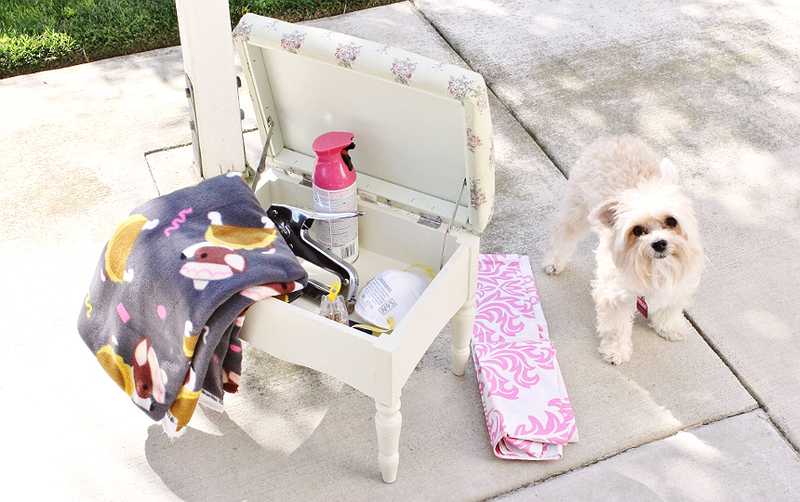 And that secret storage bench is adorable, too. Always nice to have a place to keep all your pet's things in one out-of-the-way spot. You are one of the best pet moms I know of! 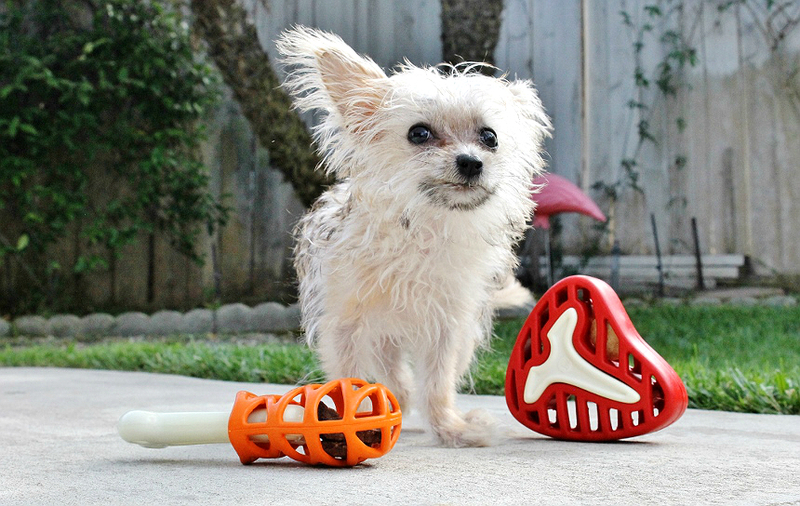 Your dogs always have the cutest toys, bedding, and more! They are too cute! These treats look super neat! I know that my doggies love to play with their food in this way too. Your little dog is so cute! I like the Hol-ee Gourmet treat toys. They are really the perfect thing to buy your furry friend. What a fun toy to buy for my sisters dog. They don't have kids but they have dogs so I like to buy them gifts for Christmas. They have a Large size that is about double, maybe near tripe this small/medium size. 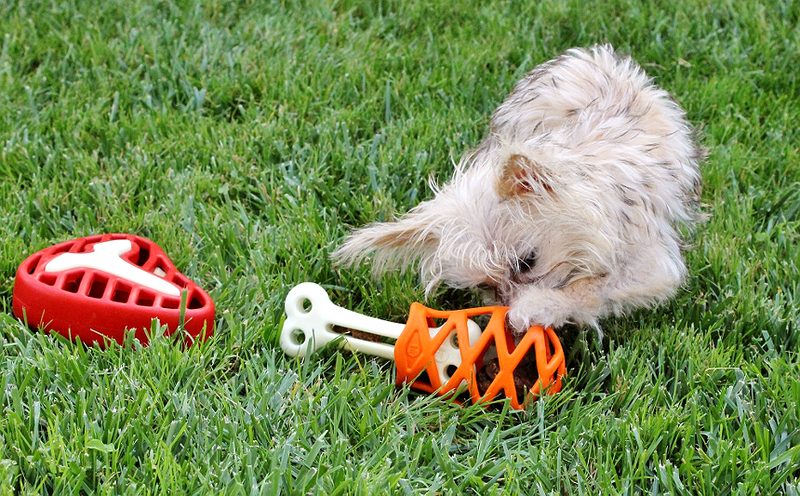 The steak is the strongest of the 3 designs and best for heavy chewers. This is a great idea! I think my dog would love that! For pet parents looking for pet travel accommodations that don't just advertise as "pet-friendly" but have made the leap to "Cat names-loving", sniff no further. There are plenty of 5-paw travel accommodations to choose from. In a recent survey of over 200 pet traveling parents it was found that pet friendly hotels & accommodations that provide the following top 5 pet-loving amenities desired by pet travelers and their pampered pets, win their business every time.